Much of my research involves poring over old files from the Foreign and India Offices. These files always evoke a peculiar academic frisson of excitement as you wait for them to be delivered from the archives. You may have only the scantiest inkling of what they might contain. If you are following up a curious reference found in a footnote, or if you are trawling long-haul through a particular file series, you may only have a one line description and a date range provided by the computer catalogue. Hence it’s always a thrill when you collect the box and return to your desk with it in your hungry hands. As you gently remove the thick file from its box and carefully open the stiff, marbled hardboard covers of the file you slowly begin to sift through the pages which are often a disconcerting mixture of brittle, heavy watermarked foolscap or near disintegrating onion skin leafs. Each file is usually the substantially reduced version, or “weeded out” contents, of a much larger series of original files that often contain tantalising hints and echoes of other pages or files which no longer exist. Yet they are always a treasure trove of the unexpected. Once, when looking through a series of files in quest of information regarding one diplomat’s movements during a particular period in his career I found the documents I was looking for were interspersed between others regarding preparations for the ill-fated 1924 expedition to Everest from which the climbers, George Mallory and Andrew Irvine, never returned. Accompanying another thick file I found a bulky envelope attached which, when opened, I found contained a long white silk scarf, called a khata, which is used by Tibetan Buddhists as a ceremonial gift of benediction. This one, the accompanying documents showed, had been given to a diplomat by Thubten Choekyi Nyima, the 9th Panchen Lama as a personal gift meant to be passed on to His Majesty King George V; instead, after several memos back and forth between various high and low functionaries of the Foreign Office, deliberating the niceties which ought or ought not to be observed in regard to such a gesture transmitted across the vast distance between Whitehall and the High Himalaya, it was evidently simply ‘filed’ away, quite literally. Leafing through such dense and endless reams one becomes very familiar with the characteristic typescripts and handwritings of certain officials and ministers. But this takes time. In some instances, only after a lot of reading does one suddenly come to realise that a particularly distinctive set of signature initials repeated on memos and in the margins denote the hand of a particularly well know politician or important civil servant. As such, historians can become quite attached to, as well as understandably quite involved with, the worlds contained within such old documents. You can’t help but begin to live them and the events they describe at times in your mind’s eye. They bring to life certain situations and the uncertainties which characterised events as they unfolded. You might already know the outcome of such events, but revisiting them through the original documentation can open up your perspective on those events in ways which you could never have known or might have imagined otherwise. When I first began working at the British Museum it was still very much run administratively on those same old civil service lines. We had similar sequences of foolscap files. I remember leafing through the general correspondence ‘circulation files’ which were passed around the offices of the curators, illustrators, and admin staff of my department. These used to contain all sorts of fascinating tidbits of information from the minutes of meetings and publisher’s new book lists, to press-cuttings and postcards from members of staff on their holidays. Once you finished reading a file you’d tick your initials off on the front and place the file in your outbox and eventually a messenger would move it on to the next office or desk somewhere down the line. The electronic immediacy and overload of today’s email and intranet has taken all the personal and personable elements of this process out of the day-to-day work routine. I never realised at the time though what a good grounding this was for my later researches, but I suddenly came to see the advantage it had given me when during the second year of my MA degree I was asked to present and lead a discussion on ‘how to go about archival research’, during which it quickly became clear that some of my younger fellow students had never properly come across the concept of paper filing systems before, despite the fact that they were all quite conversant with the little computer icons for folders, envelopes, inboxes and outboxes. The technological revolution is nothing new however, for in those old FO files from around 100 years ago I’ve come across memos discussing the virtues and expenses of supplying new fangled ‘typewriter’ machines to men in various far flung parts of the empire, and whether or not they’d be sufficiently competent enough at using them to justify the cost … Plus ça change! Leafing through these old files and finding myself drawn into the distant past they record I’d often found myself attempting to picture the men scribbling these notes and memos which are often startlingly candid – scabrous or catty, knowing or condescending, humorous or humourless – they can frequently be highly entertaining to read. I’d often pictured the well-to-do Gents in their waistcoats, scribbling at leather-topped mahogany desks in rooms filled with a blue haze of cigarette smoke, with these files piled up around them – messengers silently coming and going, filling up inboxes and emptying out-trays, wheeling barrows of such files up and down the corridors of power at the metropolitan heart of the empire. But I’d never really stopped to wonder if I might ever get to see the site of these old offices, until one day last summer suggested I might get a chance to do exactly that. 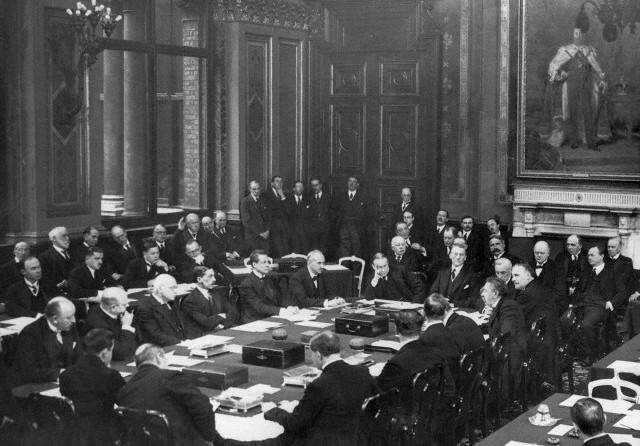 It was during a short break one weekend whilst I was writing up my MA dissertation when, whilst idly perusing the web, I happened to see a picture posted on Twitter by the FCO Historians. It was of a rather grand staircase accompanied by the commentthat the famous Chinese Statesman, Li Hongzhang, had once been carried up these stairs in a sedan chair to meet the Foreign Secretary, Lord Salisbury. The reason for posting the Tweet was that it happened to be ‘London Open House Weekend.’Hence this year I decided to see if the Foreign & Commonwealth Office (FCO), as it is now known, would be open, and, if so, I would go and see the place for myself. Happily it was, and so I went and spent several hours wandering around the very grand building which still sits at the heart of government, right next door to Number 10 itself. The Foreign & Commonwealth Office was a sorely unappreciated building for much of the last half of the twentieth century. Appointed in 1858, much of the building complex was designed by the architect, George Gilbert Scott, who is perhaps better known for designing the Albert Memorial and the Saint Pancras Hotel. The main building works took place between 1861 and 1868, with Scott’s vision being to create “a kind of national palace, or drawing room for the nation.” The result was certainly the suitably lavish realisation of Victorian splendour, designed to reflect the pomp and grandeur of the great British Empire, providing a suite of rooms in which to receive dignitaries and diplomats, sultans and statesmen alike, and in which treaties could be signed, as well as the more day-to-day administrative routines of the empire, all conducted with calm efficiency. In the later, post-colonial half of the last century such pompous grandstanding in the form of bricks and mortar became somewhat of an embarrassment, plus lack of space was becoming an issue, hence many of the rooms were therefore divided up with false ceilings and partitions put up, hiding much of the lavish though now decaying decor. Eventually proposals were inevitably made to level the place and build afresh something more modern and less laden with the burdens of history. But the wheels of such decision making moved slowly, and time perhaps inevitably alters perspective, such that a proposal was eventually made to renovate the interiors instead. The restoration was completed shortly before the turn of the millennium, and had the twin outcomes of reinstating the original Victorian scheme of ornamentation, as well as creating 25% more useable space than there had been previously due to all the crabbed partitioning. Wandering around the building today one can get a sense of what it would have looked like during the high days of British Imperialism, but when you look close up you can sense that it is still very much a functioning government building of our own era, as many of the plaques and monuments dotted on the walls between the old murals and marble statues commemorate diplomats who have died in more recent times in the Second World War, and, perhaps most notably, in the present day embassies of the Middle East. The FCO is a popular place during ‘Open House Weekend’ – a friend had tipped me off that its best to book a free ticket for your chosen time-slot on the FCO website beforehand, that way you can skip the lengthy queue outside and (as I did) walk straight in. Inside the murals of the grand staircase painted by Sigmund Goetze during World War One reminded me a little of the murals by Diego Rivera of the Palacio Nacional in Mexico City. The motifs and iconography, abounding with an odd mixture of Victorian neoclassical and Orientalist fantasies, depicting the “origin, education, development, expansion and triumph of the British Empire, leading up to the Covenant of the League of Nations”, will absorb any historian interested in late 19th / early 20th Century imperialism and colonialism for hours. One of the motifs which most struck me, amongst the badges depicting the 32 original signatories of the League that adorn the ceiling arches (and which I spotted repeated in the majolica decorations up on the ceiling joists of the Conference Room), was the emblem used to represent China. I found this quite intriguing as it was not one I’d seen before, and I wondered if it was perhaps a British invention, given collapse of the Qing Court in 1911? The Qing had officially approved an emblem – the Yellow Dragon 黄龙旗 – for a national flag in October 1862, and the republican government which replaced them after the 1911 revolution proposed a number of different flags until 1928 when they finally settled on the one which remains in use today on the island of Taiwan (oddly enough, the Qing flag is still flown in Texas). The emblem used here looks, to me, rather like some kind of odd hybrid Qing-Emperor-merman creature … I know there were British officials at the time who rather hoped for a restoration of the Chinese monarchy, but I have no idea whether this might have anything to do with it or not? 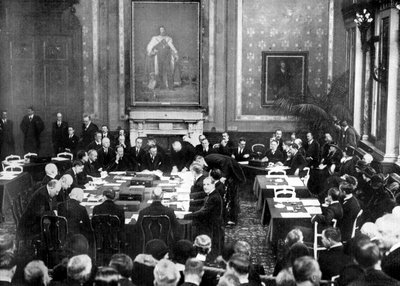 There was an interesting display of historic documents in the main room of the Locarno Suite, in which a silent newsreel was being played of the formal signing of the Locarno Treaties, a so-called ‘peace pact’ which had been drawn up in an effort to promote a spirit of international cooperation across Europe, on 1st December 1925 in that very room (hence the name). It was fascinating to sit watching this, to see Sir Austen Chamberlain presiding at the head of the table, and to look up and see behind the television screen the same marble fireplace which could be seen just behind him, with various officials in tailcoats standing there along that very wall looking back at us out of the screen from ninety years before. The adjacent Dining Room was occupied by Lord Salisbury, who used it as his personal office, and a large imposing portrait of him still presides there today. The parts of the building once occupied by the India Office are just as beguiling. The restoration works in the entrance area (through which the ‘Open House’ tour route exits) revealed the fact that the stone statues upholding the chimneypieces there (the woodwork of which had previously been painted over with cream gloss paint!) actually date from the early 17th Century and were very likely brought from the original headquarters of the East India Company. Again, the iconography of the decoration in the India Office Council Chamber is worth noting; here too, the doors, furniture, and chimneypiece were brought from the former Director’s Court Room of East India House. The chimneypiece, by Michael Rysbrack in 1730, depicts Britannia, seated by the sea, receiving the riches of the East Indies. Two female figures stand behind her representing Asia, leading a camel, and Africa, leading a lion. A river god on the right represents old Father Thames, with East Indiamen ships setting out to sea in the background. It was in this room that the Secretary of State for India and his Council met from 1868 to 1947; it was also in this room that the Three-Power Conference over Germany was hosted in 1948. The Durbar Court is perhaps the most striking part of the former India Office. The elaborate decorations adorning the building here commemorate various figures from colonial and imperial Anglo-Indian history, such as the famous Governor, Sir Warren Hastings. Originally the Court was open to the elements, but it was roofed over with glass in 1868 by its original architect, Matthew Digby Wyatt, who also designed the roof of Paddington Station and the Crystal Palace. Having spent so much time perusing so many old files created in this place, it was an added insight to wander those corridors and halls for myself at last.